Powering America – AKRA Builders, Inc.
A century ago, the Ford Motor Company was half way through the 20-year run of producing the Model T, a vehicle with a whopping 20 horsepower engine. By comparison, today’s sedans and SUVs are powered by engines producing 120-200 horsepower. But even those engines seem rather small when compared to the 2019 Dodge Challenger Demon. With more than 840 horsepower under the hood, the Demon is the largest standard production engine produced in America. The key component to the Dodge Demon is the tuborcharger produced by IHI Turbo of Shelbyville, Illinois. From their Shelbyville location, IHI serves a diverse customer base. In addition to the automotive sector, IHI provides turbochargers and superchargers for the agriculture, marine, light truck and military markets. IHI technology can be found on a range of vehicles including: Fiat, Ford, GM, GE, Isuzu, Mercury Marine, Chrysler and many more. 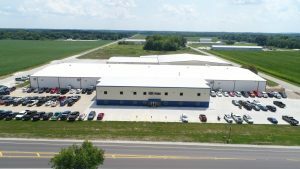 Through 2017, AKRA Builders had completed more than 100,000 square feet of office and production space, as IHI’s construction partner. In 2019, AKRA will be completing an additional 250,000 square feet of manufacturing space for IHI, as they continue to drive America’s future. Henry Ford would likely be stunned by the technology generated from his first small engine. But we think he’d be pleased to know that the integral components are still being produced in America’s heartland .